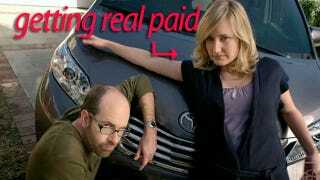 Why were mommy bloggers paid for positive stories on Toyota? Blogger Crissy Page reported getting this e-mailed pitch today from MommyNetworks.org, one of several aggregators that occasionally pitch sponsored posts. A new opportunity! Another chance to score a $10.00 Amazon gift card for the mommy bloggers who help out. There was a big report released about Toyota, by the NHTSA and NASA, stating that there was no electronic flaw found, which was originally assumed to be the cause of all the recalls with the Priuses last year. It actually turned out to be pretty much "user error" that was causing the accelerator to stick. It's a big deal for Toyota since this has affected their reputation heavily and they had a lot of negative stigma around their brand as of late, and we're helping to spread the positive news. The bloggers were then exhorted to write and Twitter their own story, or promote stories from a long list of pro-Toyota links provided by MommyBloggers.com, including at least one Jalopnik story. And they were told to "meticulously track" their efforts to receive their reward. Page said the pitch left her with a bad feeling; while similar networks send out such pitches regularly, they usually come with instructions to identify the company behind the pitch. It's not just courtesy, but a U.S. Federal Trade Commission requirement that "bloggers who make an endorsement must disclose the material connections they share with the seller of the product or service." "Don't insult us by throwing a $10 Amazon gift card our way, and providing us with a catalog of content to disseminate like a horde of mom-drones," Page said. Besides, getting mothers to embrace Toyota is a job Toyota can do all its own. UPDATE: The owner of MommyNetworks shut down her site this morning, saying she overstepped and needed to reassess whether such a business was right for her.